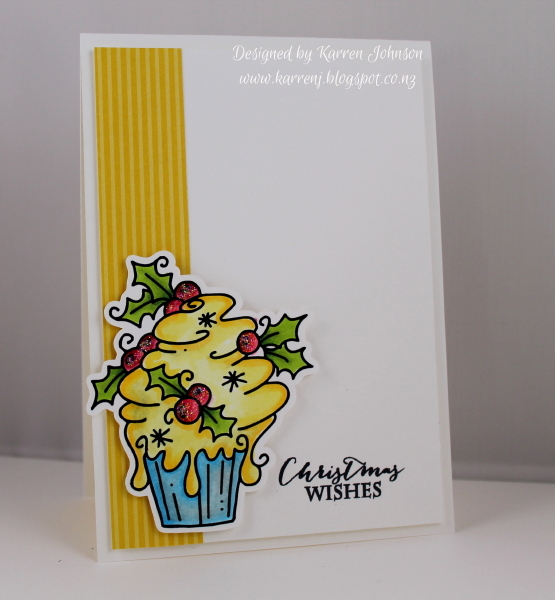 I had the chance to do a bit of stamping today, so I decided to make a card for a few challenges. 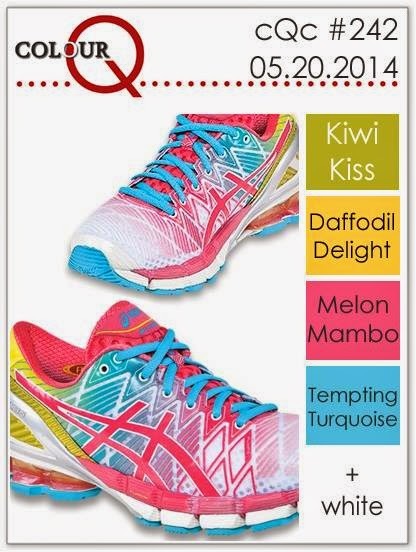 This is for Friday Mashup's challenge to use stripes, the watercolor challenge at Just Add Ink and uses the colors from ColourMe. 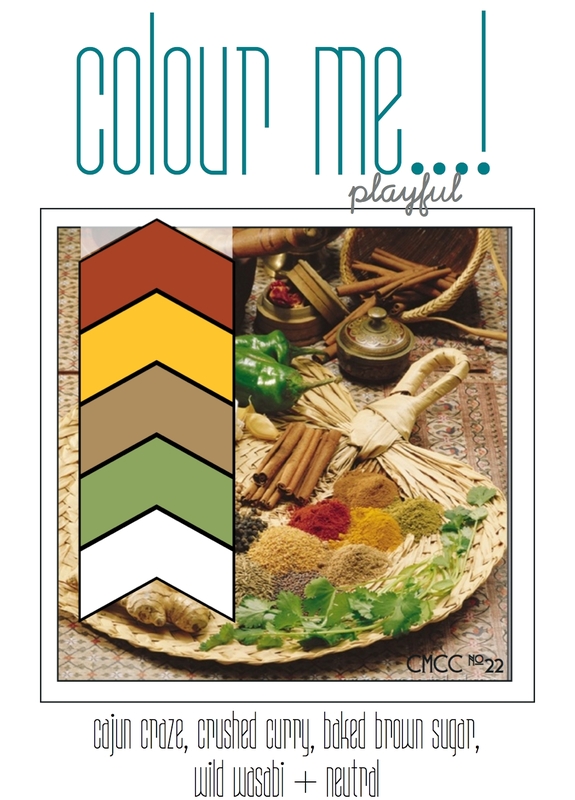 To make my main panel, I took the Wide Stripes Background stamp and colored each strip in different colors (Cajun Craze, Crushed Curry, Baked Brown Sugar). Before I stamped them, I spritzed the stamp with water and stamped onto watercolor paper. Once the panel was dry, I stamped the sentiment in Wild Wasabi. I layered the panel onto a 5" square Baked Brown Sugar base and adhered tiny strips of Wild Wasabi down each side of the watercolored panel. I cut some stars out of Cajun Craze, Crushed Curry and Baked Brown Sugar and placed them at the top right and bottom left of the center panel. The inside matches the front. Hi and welcome back for another Freshly Made Sketch Challenge. This week the fabulous and talented Jennifer Timko has given us this fantastic sketch. How versatile is this sketch??? 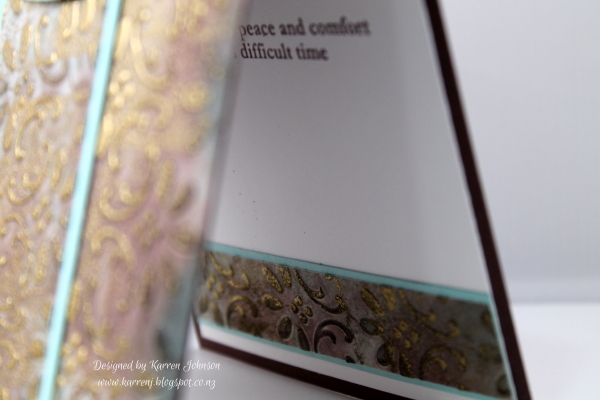 The card base is stenciled with translucent embossing paste to add a bit of interest. To color the tag, I smeared some Crisp Cantaloupe and Summer Starfruit on my craft mat then spritzed with water. I laid the die-cut watercolor paper into the inky mess and pressed down. 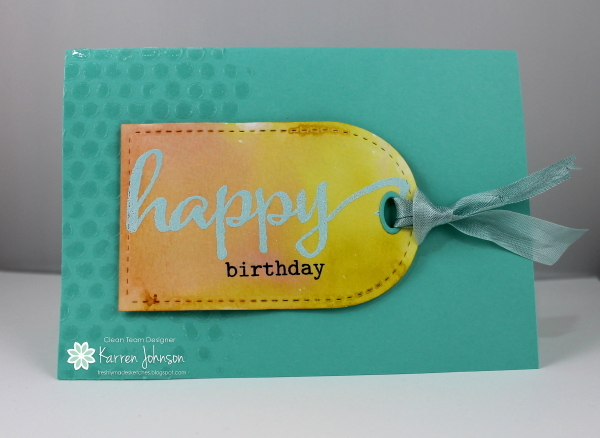 Once the tag dried, I embossed the word "happy" using Pool Party EP then stamped "birthday" using Memento Tuxedo Black. I cut the little tag hole using Coastal Cabana and tied some Pool Party seam binding ribbon around it. 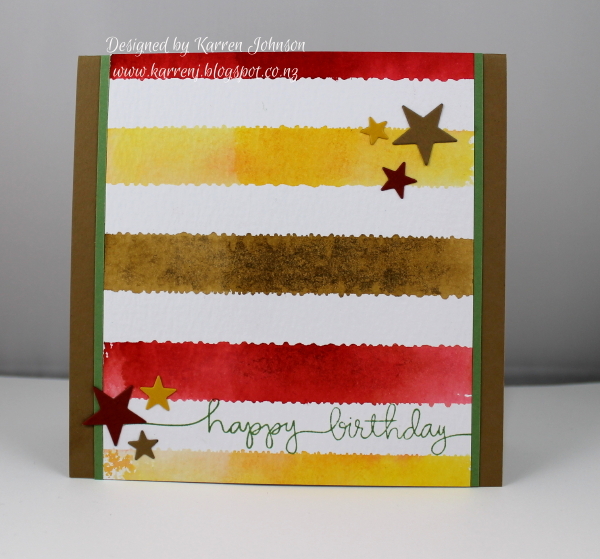 This card uses the colors from Fab Friday and the tag theme from Seize the Birthday. 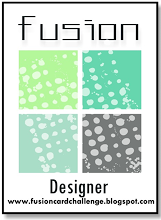 If you haven't checked out the divine inspiration from the FMS design team, head on over there now! Edited to Add: This card was one of the Fab Five. 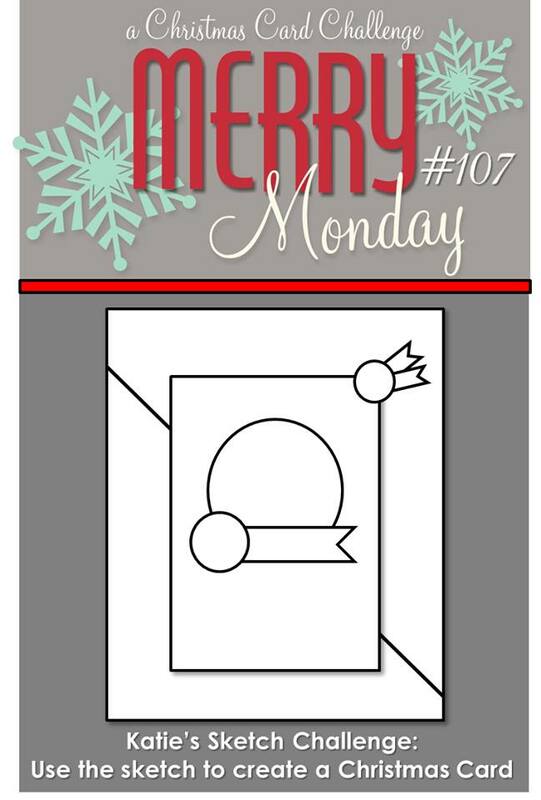 Welcome to another Merry Monday challenge! 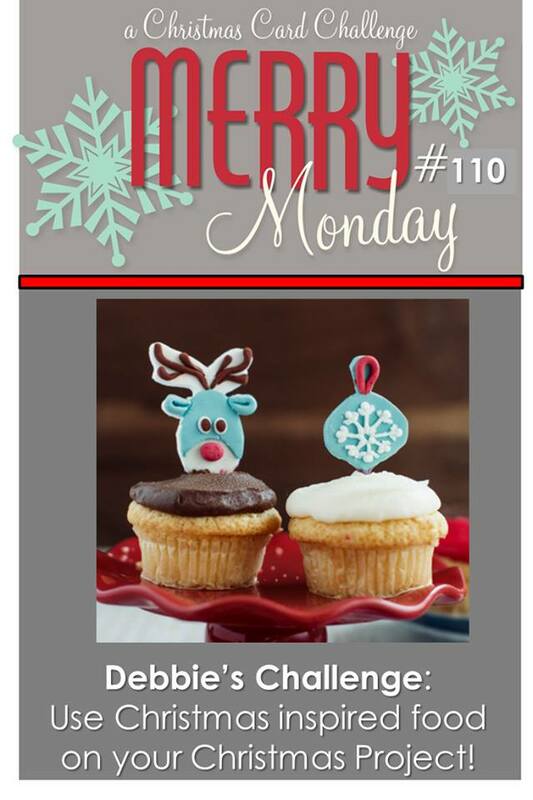 This week, Debbie has challenged us to use Christmas inspired food on our cards. 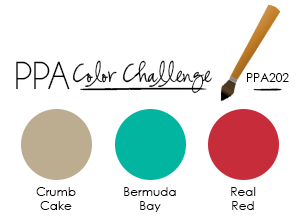 I had bought a cute digital cupcake image some months ago and knew it would be perfect for this challenge. I used the print and cut feature on my Silhouette to cut out the image then I colored it using Copics. The red berries were given a coating of Cherry Cobbler Dazzling Details to give them a bit of sparkle. 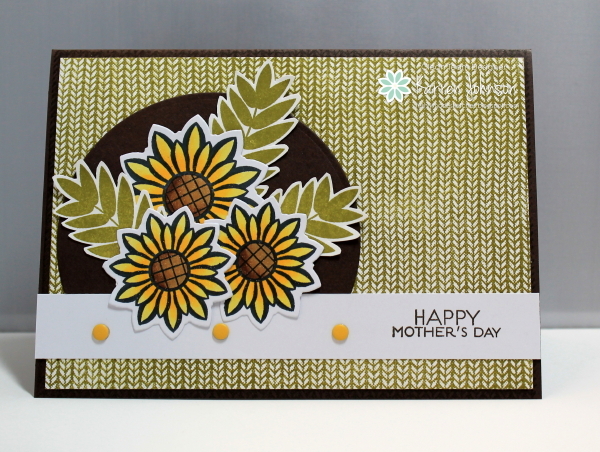 I kept the layout very simple, using a strip of Daffodile Delight DSP and a sentiment from Verve. The inside mimics the card front. Thanks for visiting. 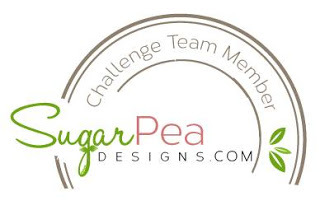 Head on over to Merry Monday to check out the inspiration from the rest of the Design Team. I had some time to get inky today - after doing the never-ending laundry and housework, of course! I decided to combine the challenges at ColourQ and CAS(E) This Sketch. 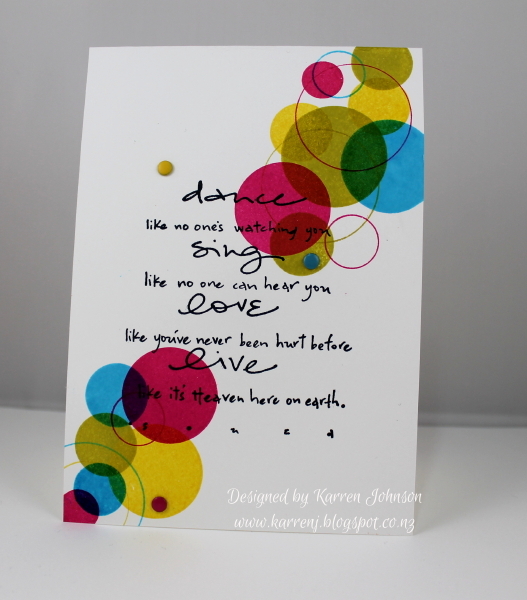 I used the challenge colors to stamp random circles from Lots of Dots in the top right and bottom left of a Whisper White card base. I used the solid circles in various sizes as well as a few outline circles. Once I was happy with the look, I dug around for a sentiment for the middle. 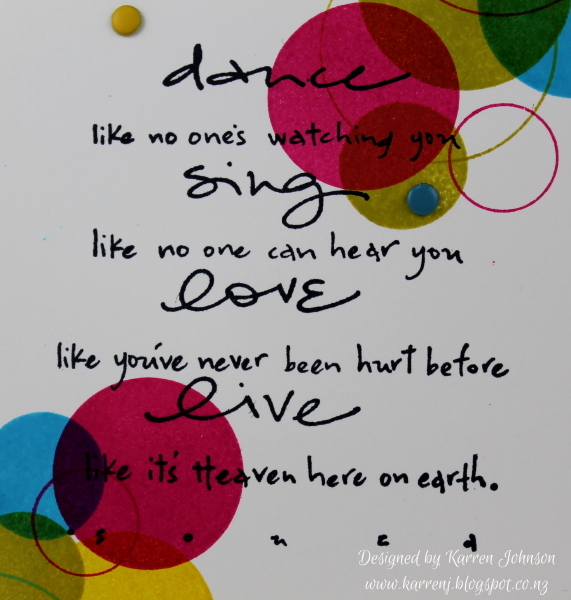 I found this old Penny Black sentiment and thought it went well with the happy and bright circles. I placed a few Candy Dots around the card and called it done. 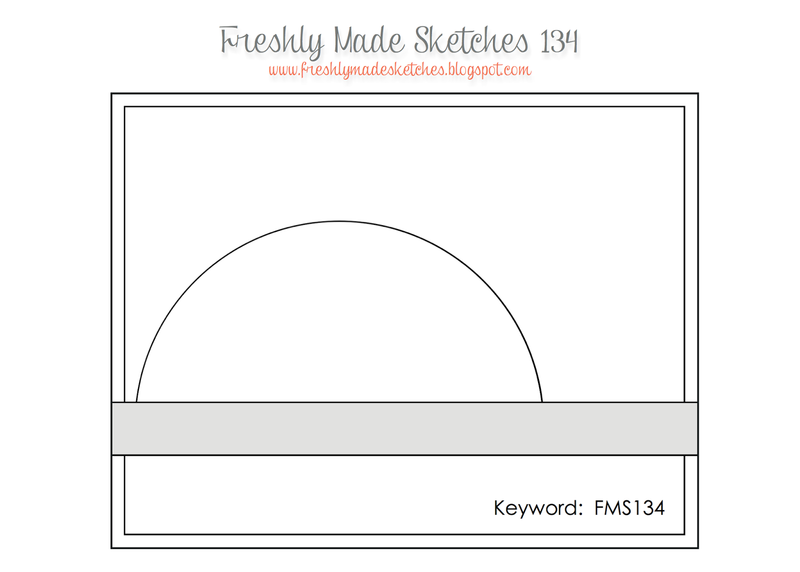 And here we are on Freshly Made Sketch Challenge Day! 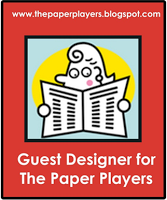 This week we have the privilege of having Jen Mitchell as our hostess. Jen, who is smart and funny, also makes the most fabulous cards! 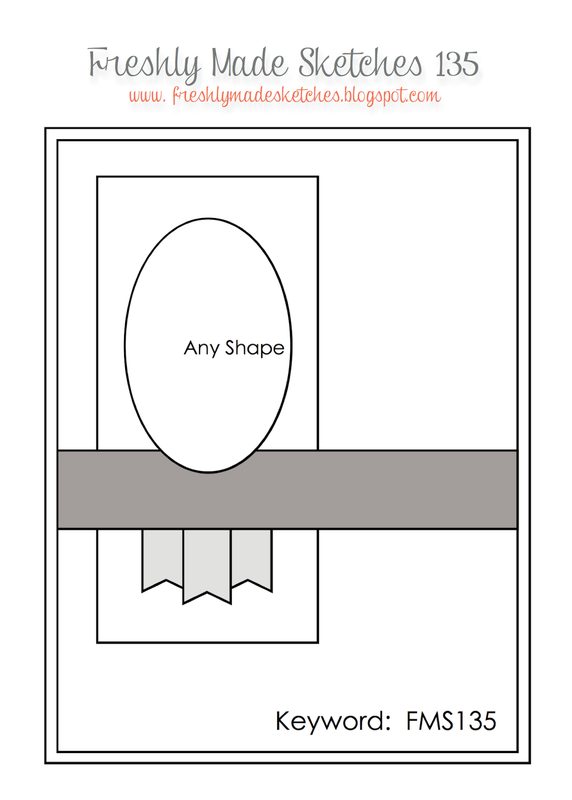 Her sketch this week is open to all sorts of interpretation as you can see by the design team cards. 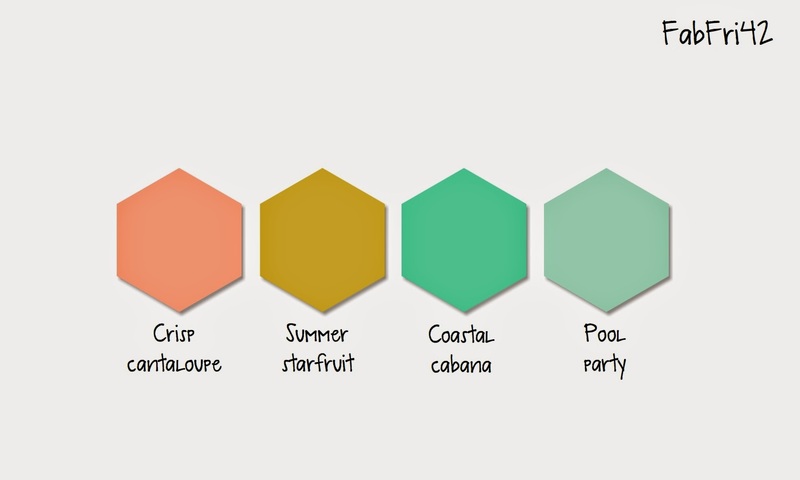 I took a fairly liberal approach with my card this week and also chose my color combo from the Color Coach - Soft Suede, Old Olive and Crushed Curry. 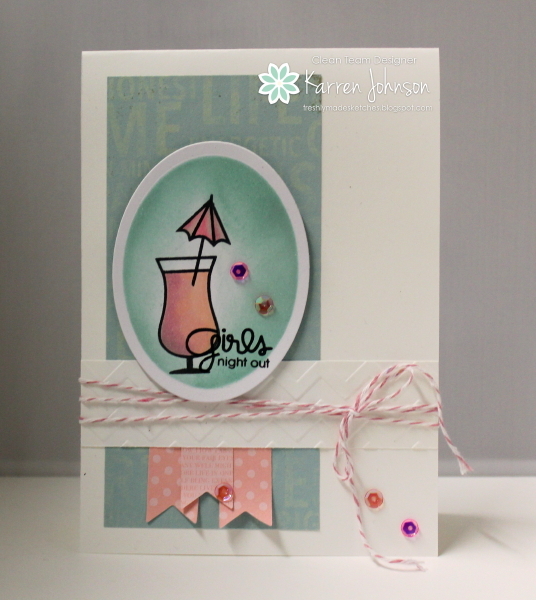 I used a die cut from Simon Says Stamp for the bottom panel and a Paper Smooches die cut for the top panel. The 'hello' is triple stacked and painted with Wink of Stella. 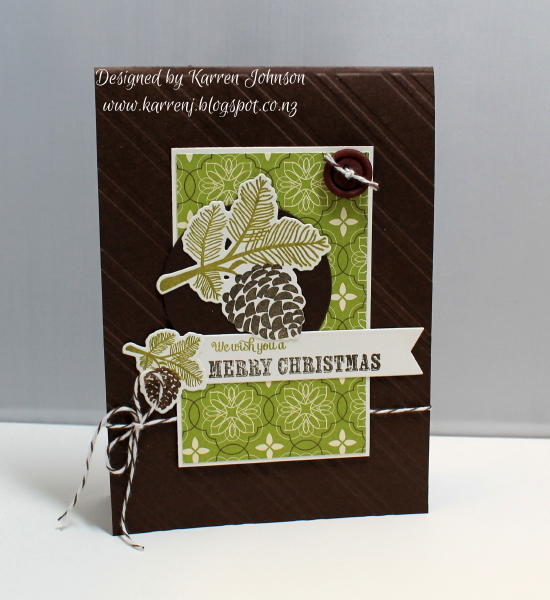 I stamped a leaf stamp from PTI's Harvest Berries set to add some more interest. A few black sequins finished off the card. You can go in many directions with this sketch - so give it a go! 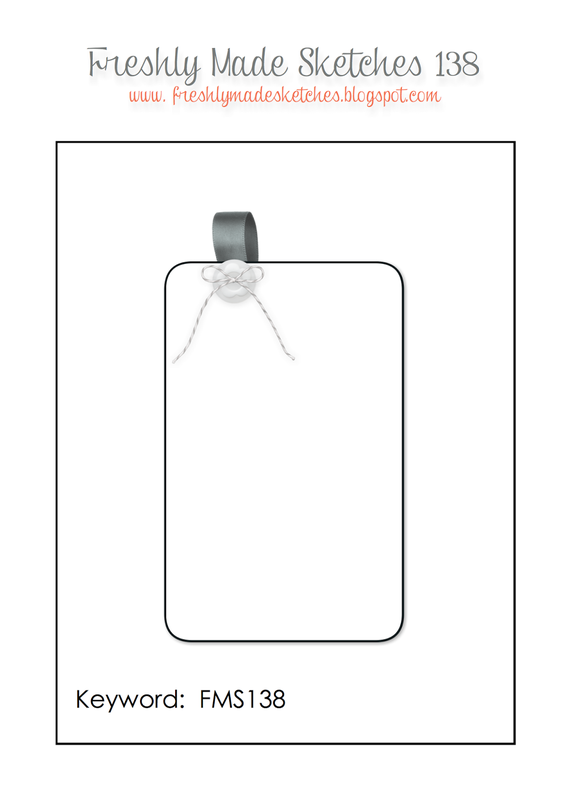 We'd love to see your card in the gallery. Welcome to another Merry Monday challenge. 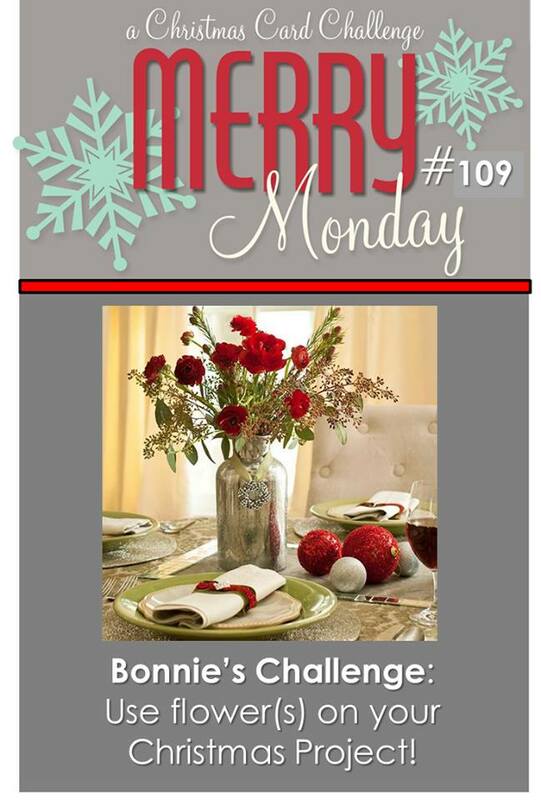 This week the lovely Bonnie has challenged us to use a flower on our Christmas card. Well, the obvious flower for me was a poinsettia so I dug out one of my favorite Christmas sets, Bells & Boughs and went to work with my Copics. 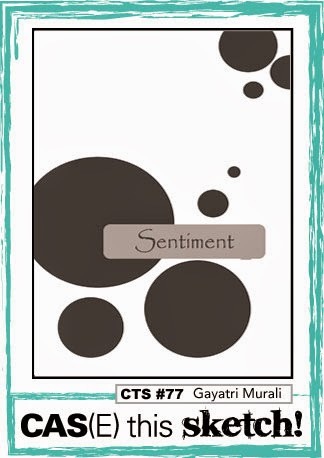 I used a sentiment from Beautiful Season and some of my hoarded Deck the Halls DSP. This card is 5" square. Thanks for looking. 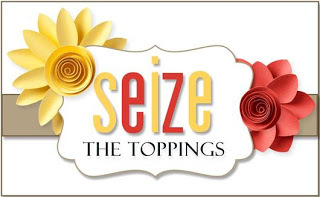 The rest of the design team has some fabulous inspiration for you so check them out. Hi everyone and thanks for visiting. 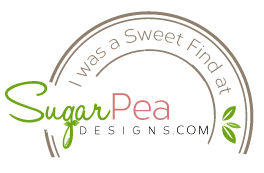 Before I get to my card, if you subscribe to my blog via email, I have switched over to MailChimp. So, assuming I've done everything right, this email should come to you in a slightly different format but with all the problems with Feedburner, I thought it wise to make the jump now. Unfortunately I have need of a sympathy card for a workmate who lost his mother very suddenly while she was overseas on holiday. I combined the sketch from Seize the Sketch with the colors from ColourQ to come up with this card. I used the faux patina technique, which is what I immediately thought of when I saw the colors at ColourQ. 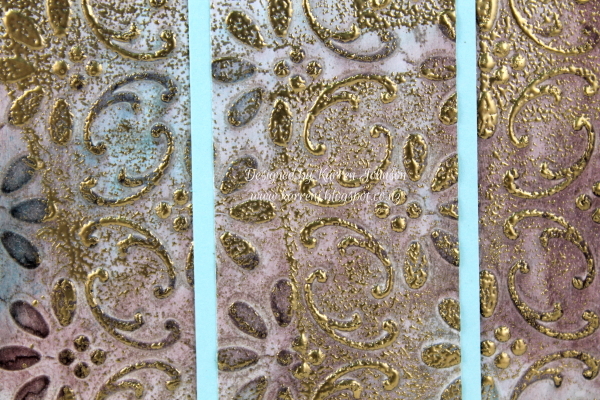 I used Pool Party, Tempting Turquoise and Chocolate Chip ink on my faux patina piece, then sprinkled some gold embossing powder over parts of the dry embossed panel. I cut it into thirds and mounted the center panel onto a piece of Pool Party. The sentiment is gold embossed. Here's a close up of the faux patina. And a shot of the very simple inside. Thanks for visiting. And thanks to everyone to subscribes to my blog - I do appreciate you! 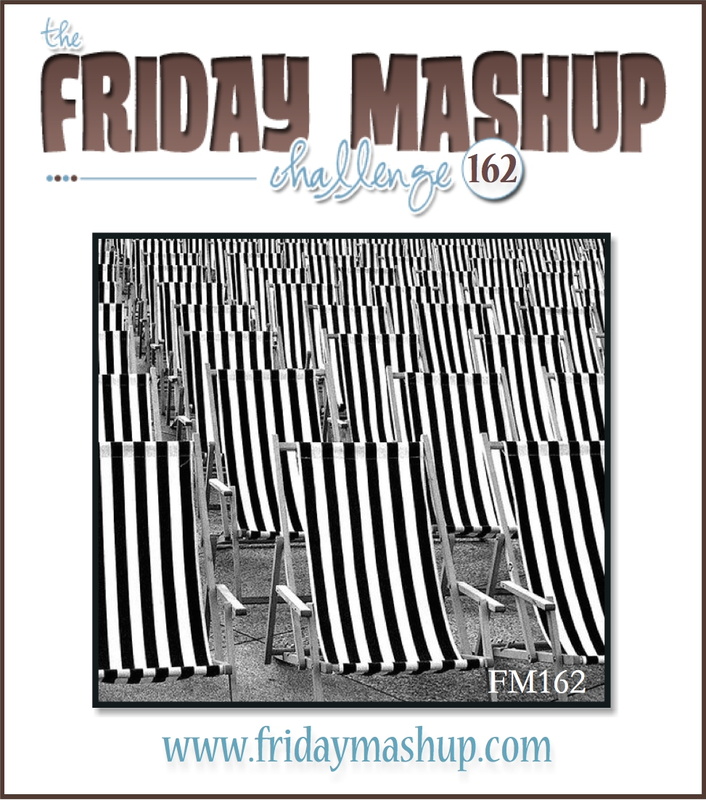 It's Freshly Made Sketch Challenge day and this week our hostess is the very talented Amy. She has come up with a fabulous sketch. Check it out! Isn't this a fun sketch? I decided I wanted to make DSP the feature of my card, which is unusual because I very rarely think to use DSP at all! As part of my unpacking, I found this old specialty DSP called Parisian Breeze. It's beautifully textured with subtle patterns and has Baja Breeze, Crumb Cake and Chocolate Chip as its feature colors. Gorgeous! 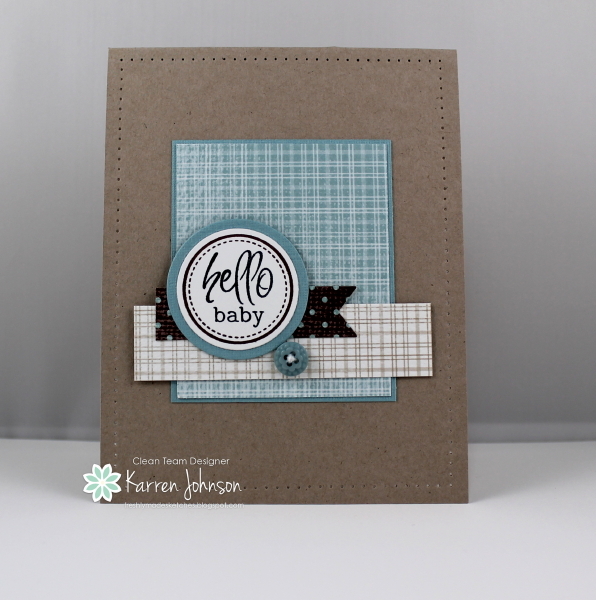 I thought these colors lent themselves to a baby boy card, so I put two stamp sets together to come up with the sentiment. Thanks for looking. Don't forget to check out what the rest of the design team have done with Amy's sketch. I hope you'll find time to join in. Welcome back for another Merry Monday challenge. 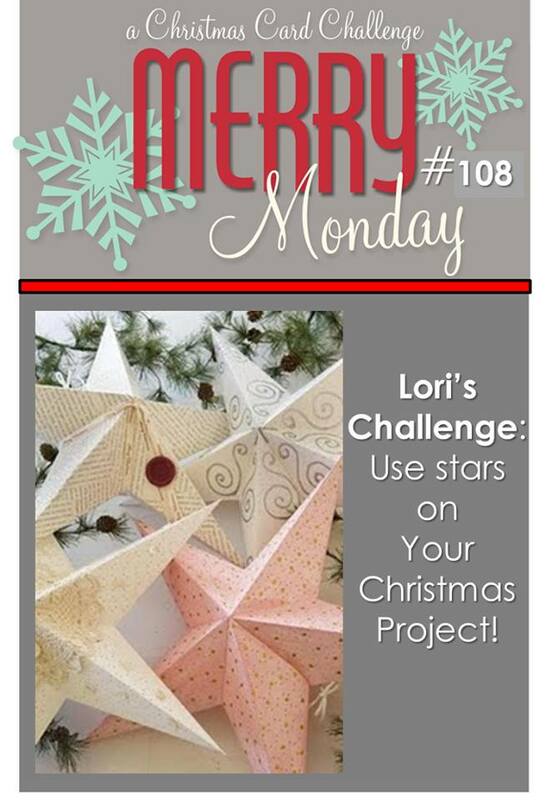 This week, Lori has challenged us to use stars on our cards. So without further waffle, here's my card for the challenge. I didn't get a lot of time to make anything this weekend, so my card is necessarily CAS. 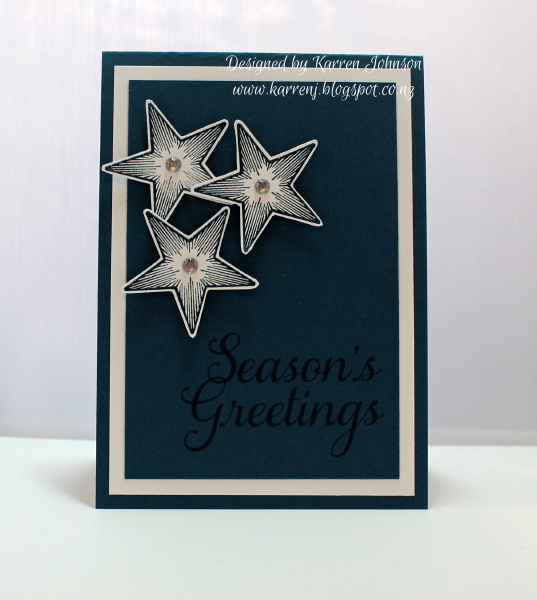 I found the only star stamp I have that's not in storage, which was Christmas Classics and clear embossed it onto Whisper White using Midnight Muse ink. 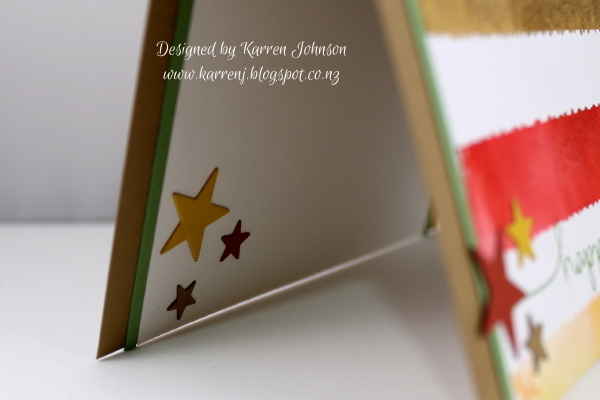 I then cut out each star (because all my punches are in storage!) and adhered to a Midnight Muse panel using dimensionals. The greeting was going to be white embossed, but I actually liked the watermark look of tone-on-tone, so I left it as it was. It's time for another Freshly Made Sketch challenge! This week, the lovely Narelle from across the ditch in Australia is our hostess. 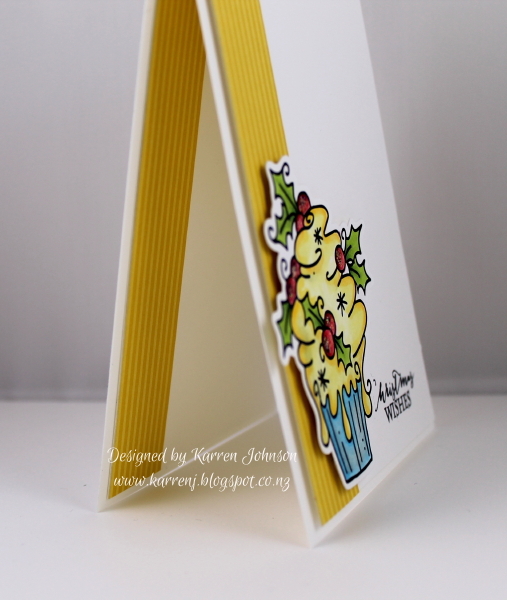 Check out Narelle's blog - she is the queen of layers and fussy cutting! Here's the fabulous sketch Narelle has created for us. I went pink and blue with my card this week. 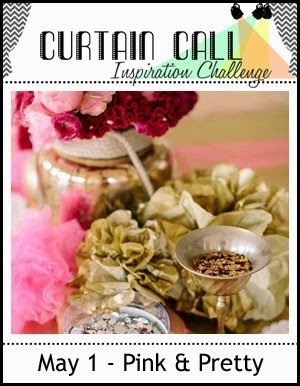 I'm also entering this card into the pink & pretty challenge over at Curtain Call. I don't often use pink so even though this doesn't have copious quantities of pink, it's pretty pink to me! I stamped some images from Paper Smooches Free Spirits onto Xpress-it cardstock and colored them with Copics. I cut it with an oval die and before removing the die, I sponged some Pool Party ink around the image. It's hard to tell from the photo but the horizontal white strip is dry-embossed with the Chevron embossing folder. The gorgeous sequins came as a freebie with my Winnie & Walter order and were perfect for this pink challenge! Head on over to the Freshly Made Sketches website and check out the fabulous inspiration from the DT. Every single one of the cards this week are gorgeous! It's Merry Monday time! This week, Katie has challenged us with a sketch. I have to admit, I struggle with angled elements on cards, so I sort of cheated and used a diagonal stripes embossing folder for the angled elements. 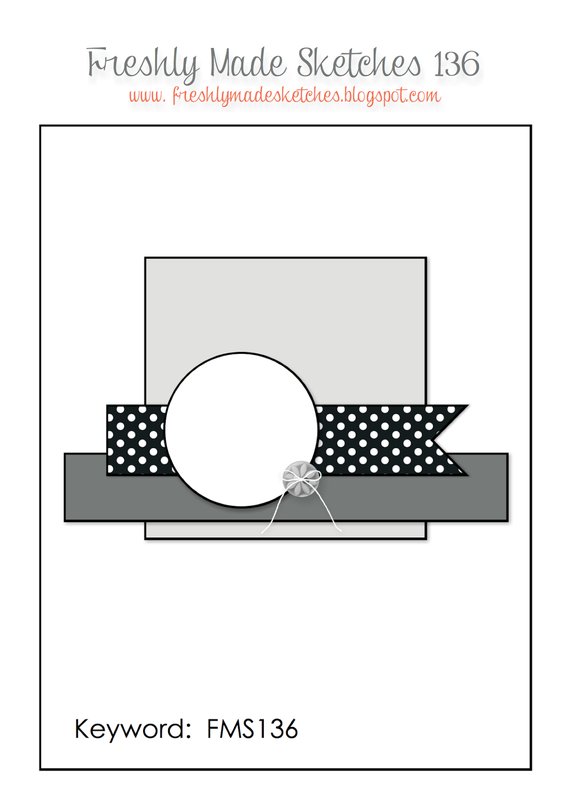 I had to add a layer of twine to cover up where I had to repeat the folder to cover the whole card front. The central image is from the Peaceful Pinecones set by PTI. I've gotten so much use out of this set. I love the little baby pinecone! The DSP is from a retired pack called Candlelight Christmas. 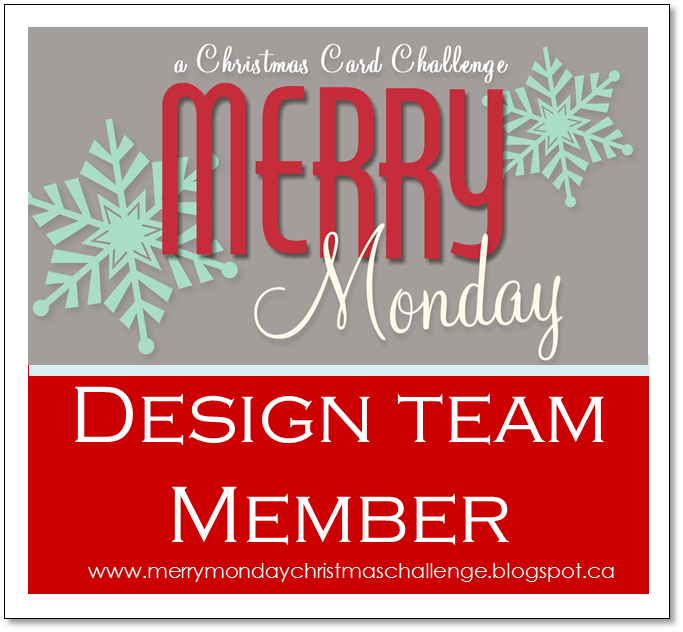 Head on over to the Merry Monday blog to check out the inspiration from the rest of the design team. We are into our last weekend living in our garage - yahoo! All the earthquake repair work has been completed and now we're just waiting for new carpet and vinyl to be laid during this week and we can move back into our house! It hasn't been as painful as I thought as our garage is pretty big and we have split it into "rooms" but I'll be glad to get back to normal. 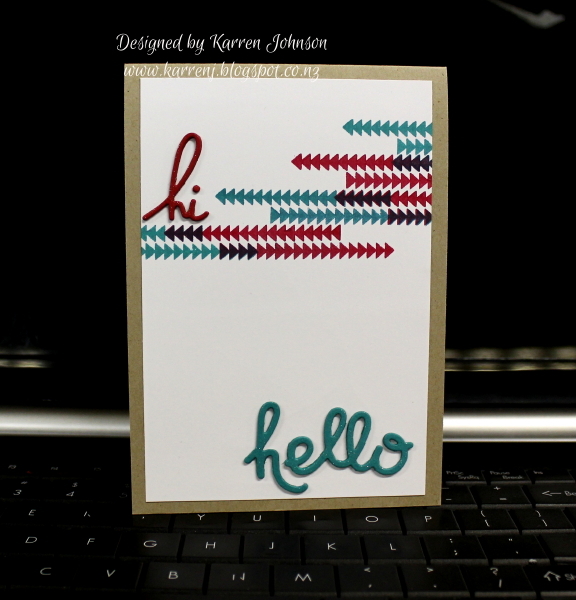 This card uses the colors from Pals Paper Arts and the sketch from CAS(E) This Sketch. I had to take this photo on my laptop keyboard, which makes for a different sort of background! I used the Trifecta stamp set from Mama Elephant to stamps some triangles in a pattern roughly matching the sketch. I used Bermuda Bay and Real Red ink and in some places, I over-stamped to give a third, darker color. The die cuts are stacked three layers high and covered with Wink of Stella, so nice and shimmery IRL. A Crumb Cake card base finishes off the card. It's time for my favorite challenge - Freshly Made Sketches. This week it's my sketch! My mother is a knitter and when I saw this Impression Obsession stamp called Knit, it was a pretty easy decision to buy it. I love how realistic it looks! 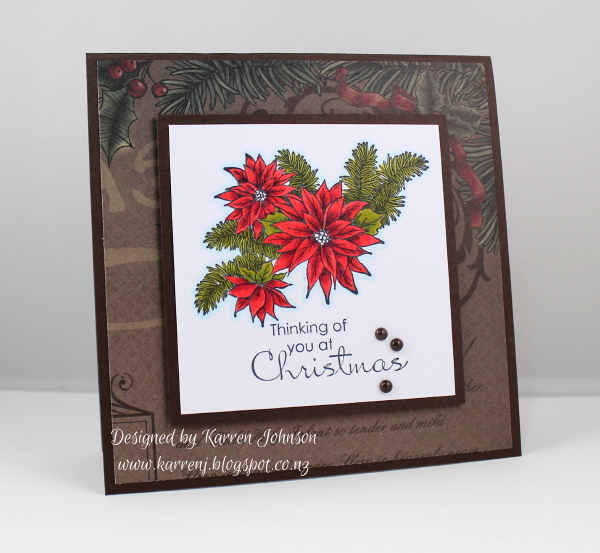 I combined that stamp with some stamps and dies from Verve called Lean on Me as well as some leaves from Clearly Besotted. This card is an equal opportunity card! I colored the flowers with copics and painted them with Wink of Stella. I then stamped the leaves with Old Olive ink before fussy-cutting them. I layered these onto a partial circle in Early Espresso. 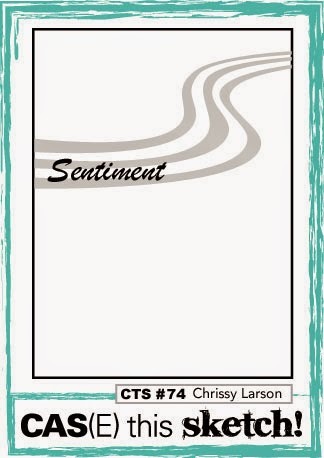 I kept the sentiment panel nice and simple so that the sentiment stands out. A few candy dots finishes off the card. Thanks for looking. Head on over and check out the inspiration from the talented design team. I really hope you give my sketch a go.